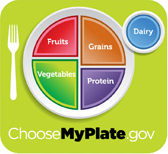 Innovative options provide healthy balanced meals. Curb caffeine consumption! Too much caffeine can cause irritability and make it difficult to concentrate. Choose caffeine- free beverages like milk, juice, water, lemonade or caffeine-free sodas.